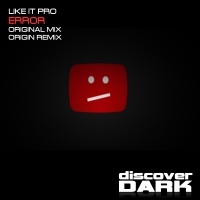 Like It Pro returns to Discover Dark with a grinding beast of tech trance audio simply entitled Error. A tough syncopated bottom end drives the tune to the break which opens up in sinister style. This is dark trance at its evil best. Origin take up the reins for the remix - after a short hiatus they are back with a vengeance and one of their best remixes to date. 'Error' is available now from Beatport and iTunes.